Direct replace of the original shift knob and screw on. 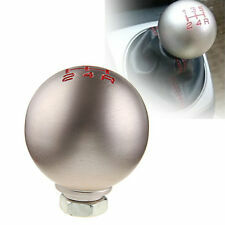 1 x Car Manual Shift Knob. Fit for manual transmission cars. Color: White. Three adapters size: 8 mm(0.31")/10mm(0.39")/12mm(0.47"). Size: 120mm 68mm/4.7" 2.6". Style: Knife Handle / Pistol Grip Handle. 1x Gear Shift Knob 1x Allen key. Material: Aluminum Alloy. Universal fit for most manual car auto truck. Color: Black. Our product have3 color :Grey / Black /Gold. Style: Knife Handle / Pistol Grip Handle. 1x Gear Shift Knob 1x Allen key. Material: Aluminum Alloy. Our product have3 color :Grey / Black /Gold. 3x Rubber Sleeve. Universal fit for most manual car auto truck. Take off the original gear shift knob;. Spin this knob into gear shift lever;. Only one gear shift knob is included. 1 x 6 Speed MT Gear Shift Knob. for Honda Manual Transmission Models. Material: Aluminum Color: Silver. Material: Real Carbon Fiber and Aluminum Alloy. 1X Car Gear Knob. It is a good choice for you to update your car. It will improve driving feel and shifting due to low weight and sturdy. High resistance, non-corrosive, high temperature tolerance and low thermal expansion. Color: Carbon fiber look (Not real carbon fiber). 1 x Gear Shift Knob. No modification required, directly replace your original knob. Universal for most manual transmission vehicles. 1 x Wrench Tool. Remove the original gear knob from shifter. Place the gear knob directly over the shifter,take the right size of the adapter to make it fasten. Finished installation,ensure the gear knob is firmly attached to the shifter and confirm it works correctly. 1, Remove the original car gear shift knob. 3, Put The gear head into the shift knob. 4, the gear head directly set into the shift knob rod. 2, take Plastic adapters suitable size For shift knob. 1 x Shift Knob. Remove the original shift knob from the shifter. 1 × Car shift knob. 3 Put The gear head into the shift knob. 4 the gear head directly set into the shift knob rod. T ake suitable adapters For shift knob. Direct replace of the original shift knob and screw on. 1 x Car Manual Shift Knob. Fit for manual transmission cars. Three adapters size: 8 mm(0.31")/10mm(0.39")/12mm(0.47"). Size: 120mm 68mm/4.7" 2.6". 1pc Car Shifter Lever. Universal fits for Honda. This item have 3 months warranty. Comfortable hand feels as well as cool appearance. Unique design, exquisite and sleek. High resistance, non-corrosive, high temperature tolerance and low thermal expansion. Color: Carbon Fiber Look (Not Real Carbon Fiber). 1 x Gear Shift Knob. Universal for most manual transmission vehicles. Add a stylish and fashionable look to your car. We will try our best to resolve the issues. 1 x Car Manual Carbon Fiber Shift Knob. Material: Carbon Fiber. Fit for manual transmission cars. Style: Ball. 3 x Thread adapters. Fashion design makes your car stylish. Thread adapter size: 7mm(0.3")/8mm(0.3")/9mm(0.4"). 1, Remove the original car gear shift knob. 2, take Plastic adapters suitable size For shift knob. 3, Put The gear head into the shift knob. 4, the gear head directly set into the shift knob rod. 1 x Shift Knob. 1x Gear Shift Knob 1x Allen key. Style: Knife Handle / Pistol Grip Handle. Universal fit for most manual car auto truck. Color: Gold. Our product have3 color :Grey / Black /Gold. 3x Rubber Sleeve. Size: 129mm x 46mm / 5.08" x 1.81". Remove the original car gear shift knob. Put the gear head into the shift knob. The gear head directly set into the shift knob rod. Take plastic adapters suitable size for shift knob. Black leather with red stitch, comfortable grip. Style: Knife Handle / Pistol Grip Handle. 1x Gear Shift Knob 1x Allen key. Color: Grey. Our product have3 color :Grey / Black /Gold. Universal fit for most manual car auto truck. Color: Silvery. 1pc Car Shifter Lever. Universal fits for Honda. Made from Aluminum. Comfortable hand feels as well as cool appearance. Unique design, exquisite and sleek. High resistance, non-corrosive, high temperature tolerance and low thermal expansion. Direct replace of the original shift knob and screw on. 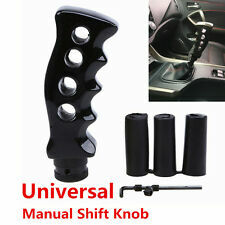 1 x Car Manual Shift Knob. Material: Carbon fiber. Fit for manual transmission cars. Four adapters size: 8mm(0.3")/9mm(0.4")/11mm(0.4")/12mm(0.5"). 1pc Car Shifter Lever. Universal fits for Honda. Made from Aluminum. 1pc Hex Wrench. Comfortable hand feels as well as cool appearance. Unique design, exquisite and sleek. High resistance, non-corrosive, high temperature tolerance and low thermal expansion. Style: Knife Handle / Pistol Grip Handle. 1x Gear Shift Knob 1x Allen key. Universal fit for most manual car auto truck. Color: Black. Our product have3 color :Grey / Black /Gold. 3x Rubber Sleeve. 1 x Gear Shift Knob. 3 x Different Size Adapters. Material: Aluminum. Color: Silver. Universal fit for most manual car vehicles. Easy to install, direct screw on. Height: 7.6cm/2.7". Process: CNC. Color: Imitation Carbon Fiber. Universal fit for 8mm,10mm,12mm manual shift knob. 1 Remove the original car gear shift knob. 3 Put The gear head into the shift knob. 4 the gear head directly set into the shift knob rod. 1pc Car Shifter Lever. Universal fits for Honda. Made from Aluminum. This item have 3 months warranty. Comfortable hand feels as well as cool appearance. Unique design, exquisite and sleek. High resistance, non-corrosive, high temperature tolerance and low thermal expansion. Color: Carbon Fiber Look (Not Real Carbon Fiber). 1 x Gear Shift Knob. Universal for most manual transmission vehicles. Add a stylish and fashionable look to your car. 1 x Wrench Tool. 3 x Mini Screws. Take off the original gear shift knob;. Spin this knob into gear shift lever;. Only one gear shift knob is included. 1 x 6 Speed MT Gear Shift Knob. for Honda Manual Transmission Models. Type: 6 Speed. Style: Knife Handle / Pistol Grip Handle. 1x Gear Shift Knob 1x Allen key. Color: Grey. Universal fit for most manual car auto truck. Our product have3 color :Grey / Black /Gold. 3x Rubber Sleeve. Size: As the picture showed. Put the gear head into the shift knob. - Remove the original car gear shift knob. - The gear head directly set into the shift knob rod. - Take plastic adapters suitable size for shift knob. 1 x Gear Shift Knob. Color: Khaki black. 1 x Gear Shift Knob. 2 x Adapters. The handle winded with nylon cord, comfortable hand feel, increase the friction. Universal fit for most manual transmission cars. Unique and cool design, upgrade your car interior appearance. 1 x Manual gear shift knob. 1 Remove the original car gear shift knob. 3 Put The gear head into the shift knob. 4 The gear head directly set into the shift knob rod. 2 Take Plastic adapters suitable size For shift knob. 1X Car Gear Knob. Material: Aluminum. Color: Colorful. It is a good choice for you to update your car. It will improve driving feel and shifting due to low weight and sturdy. High resistance, non-corrosive, high temperature tolerance and low thermal expansion. 1x Gear Shift Knob. Universal fit for most manual car auto truck. Fits for most car manual transmission. 3x Rubber Sleeve. 1x Allen key. Color: Black Silver. Size: As the picture showed. Material: Aluminum Leather. 1, Remove the original car gear shift knob. 3, Put The gear head into the shift knob. 4, the gear head directly set into the shift knob rod. 2, take Plastic adapters suitable size For shift knob. No modification required, directly upgrade your original knob. Universal fits for Honda. This item have 3 months warranty. Comfortable hand feels as well as cool appearance. Unique design, exquisite and sleek. High resistance, non-corrosive, high temperature tolerance and low thermal expansion. 1 X Car Shift Knob Boot Dust Cover. Color: Black with blue stitch. This item have 3 months warranty. Fit for most of cars. Easy to install and replace the original one. Dust proof makes your car clean and tidy. Style: Knife Handle / Pistol Grip Handle. 1x Gear Shift Knob 1x Allen key. Universal fit for most manual car auto truck. Our product have3 color :Grey / Black /Gold. 3x Rubber Sleeve. Color: Grey. Size: As the picture showed. Style: Knife Handle / Pistol Grip Handle. 1x Gear Shift Knob 1x Allen key. This item have 3 months warranty. Our product have3 color :Grey / Black /Gold. 3x Rubber Sleeve. Universal fit for most manual car auto truck. 1 x Gear Shift Knob. Note: Not suitable for car model which shift lever with button. 3 adapter size: 8mm, 10mm, 12mm. Universal fit for most manual transmission cars. Color: Blue. 3 x Adapters. Overall size: 99 x 37mm. 1x Gear Shift Knob 1x Allen key. Style: Knife Handle / Pistol Grip Handle. Universal fit for most manual car auto truck. Our product have3 color :Grey / Black /Gold. 3x Rubber Sleeve. Color: Gold. Size: 129mm x 46mm / 5.08" x 1.81". 2, take Plastic adapters suitable size For shift knob. 1, Remove the original car gear shift knob. 3, Put The gear head into the shift knob. 4, the gear head directly set into the shift knob rod. 1 x Shift Knob. 1 x Car Handbrake Cover. Pattern: Stripe. Color: Red. (As picture shown). Size: Long: 12.6 cm/4.96" Approx. Material: Aluminum. Make your car more stylish and generous. Made from Aluminum. Unique design, exquisite and sleek. This item have 3 months warranty. Comfortable hand feels as well as cool appearance. High resistance, non-corrosive, high temperature tolerance and low thermal expansion.